Larry’s life began on October 2, 1944 in Denver, Co. He is the son of Robert W. and Mary Agnes (Hardesty) Hoag. Larry is a 1962 graduate of Yates Center High School and served his country in the United States Army and Kansas National Guard. He was united in marriage to the former Jackie Dreher-Laymon on August 2, 1974 in El Dorado. Larry worked for the Kansas Department of Transportation as a senior engineering technician, retiring after 38 years. He was a parishioner of St. John the Evangelist Catholic Church. Larry enjoyed fishing; was an avid Kansas City Chiefs, Kansas City Royals and Dale Earnhardt, Jr. fan. He was also a HO scale model railroad enthusiast and enjoyed running his “railroad” and sharing it with his friends and family. His loving family includes his wife Jackie Hoag of El Dorado, children Janet Chastain, Suzanne Zerblis, Tammy Laymon and Jim Laymon II, all of El Dorado; grandchildren Joshua (Shauntà) Chastain, Jackie (Martin) Borquez, Zachary Chastain, Meranda (Buddy) Chastain, Christopher Chastain, Marcus Laymon, Chauney (Domonique) Jojola, Jordan Laymon, Kele Laymon and Camden Laymon; nine great grandchildren and sister Linda Wood of Chanute. 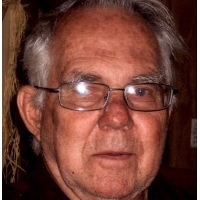 Larry passed away on February 9, 2019 at El Dorado Care and Rehabilitation. He is preceded in death by his parents and brother Jim Hoag. His family will gather with friends on Sunday from 2-4 p.m. at the Carlson Colonial Funeral Home where the Rosary service will begin at 4 p.m. Mass of Christian Burial will be celebrated on Monday at 10 a.m. at St. John the Evangelist Church led by Father John Lanzrath. Mass will be followed by military honors at the church. He will be laid to rest in Sunset Lawns Cemetery. Memorial contributions in Larry’s name may be directed to the Disabled American Veterans. Please sign his online guestbook and leave a memory of Larry at www.carlsoncolonial.com.